The integration features a graphical user interface, supports complex batch operations and can be scripted with its MAXScript scripting based API. Great care has been taken to ensure a high degree of usability and productivity even when using InstaLOD for Autodesk 3ds Max for the first time. 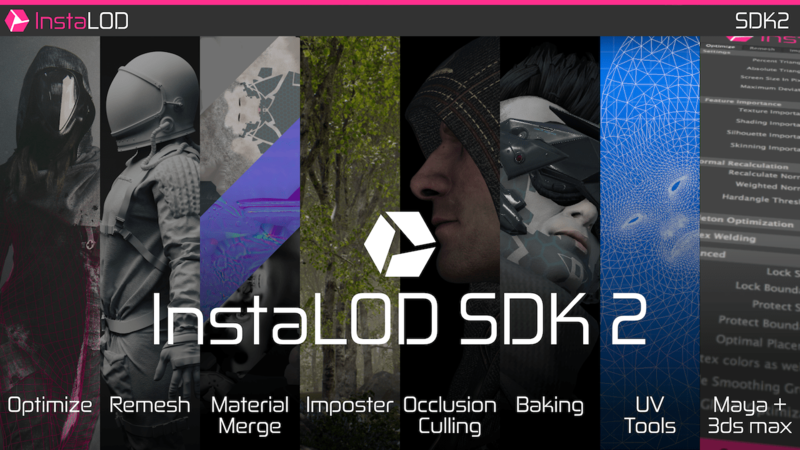 Please refer to the InstaLODCmd SDK2 documentation for an overview of all features. Teams using InstaLOD SDK 2 Update 2 have the option of getting a private instruction session via Skype video. The following versions of Autodesk 3ds Max are supported: 2014, 2015, 2016, 2017, 2018, 2019+. 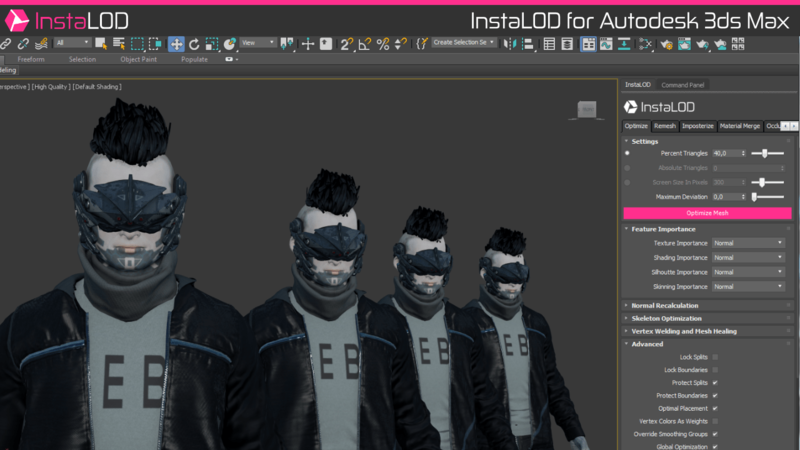 InstaLOD for Autodesk 3ds Max uses InstaLODCmd as backend for optimization operations. 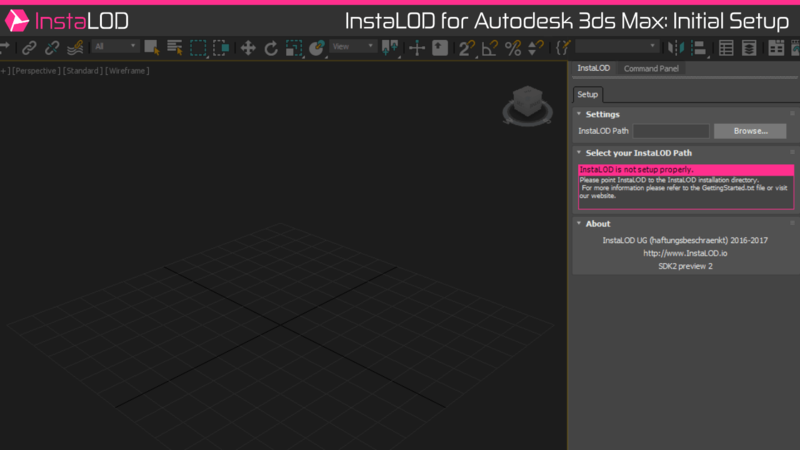 InstaLODCmd must be installed before you can start using InstaLOD for Autodesk 3ds Max. Please refer to the InstaLODCmd documentation on how to install InstaLODCmd on your workstation. Once you have installed and authorized InstaLODCmd on your workstation unzip the InstaLOD for 3ds Max file. Copy the InstaLOD_3dsMaxIntegration.ms file into your 3ds Max startup scripts folder \scripts\startup, normally found within your 3ds Max user folder at \Users\\AppData\Local\Autodesk\3dsMax\<3dsmax-version>\<3dsmax-language>. Once the integration’s script file is copied to your 3ds Max’s scripts folder you can start 3ds Max. The script will automatically create the InstaLOD menu item, that can be used to spawn the InstaLOD settings window. On the first start of InstaLOD, it is necessary to point InstaLOD for 3ds Max to the installation directory of InstaLODCmd. Click the Browse...-button and browse to the InstaLODCmd installation directory on your workstation. If InstaLODCmd was found in the specified directory the window contents will change. If your machine has already been authorized for InstaLOD you can start using InstaLOD for Autodesk 3ds Max now. 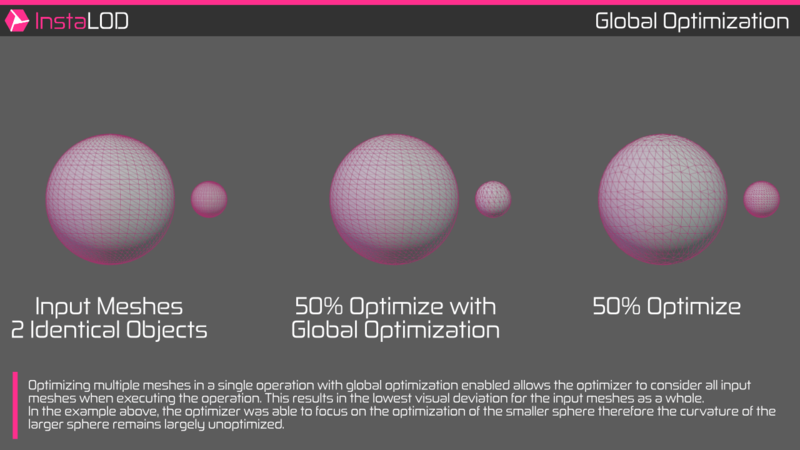 InstaLOD SDK 2 introduces a new feature called ‘Global Optimization’. By right-clicking on the mesh operation execution button and selecting Save as Batch-Profile... the current mesh operation settings will be saved as batch profile inside the directory of your InstaLODCmd installation. On the Batch-tab one saved profiles can be selected and executed on the current mesh selection in parallel. This is a great way to create a complete LOD chain with a single click. To delete a saved batch profile open the Batch-tab. Right click on the Execute Batch button and select Delete selected Batch Profiles to delete all selected profiles. Another great feature of InstaLOD for Autodesk 3ds Max is the ability to create and export multi operation batch profiles for InstaLODCmd. To export a multi operation batch profile open then Batch-tab and select all saved batch profiles that will be included in the multi operation. Right click the Execute Batch button and select Export as InstaLODCmd Profile... to export the profile for InstaLODCmd. and converted back into a custom material in the post-optimization callback. InstaLOD for Autodesk 3ds Max provides two functions that are invoked pre and post optimization for each object used in the operation. on the object that fully support undo. Once control returns back to 3ds Max the undo chunk will be rolled back and the object will be reverted to it’s original state before running the optimization. any of the optimization functionality. InstaLOD for Autodesk 3ds Max saves all settings that are relevant to building optimization profiles in nested structures. The naming convention for the settings is INSTALOD_SETTINGS_INSTANCE.InstaLOD_[type]Settings. [field] where [type] is the mesh operation type and field is a corresponding settings field e.g. INSTALOD_SETTINGS_INSTANCE.InstaLOD_OptimizeSettings.PercentTriangles. The [field] names are matching the names of variables defined in the InstaLOD C++ SDK. Determines if the current InstaLODCmdPath is valid. Returns a string containing InstaLOD license information. This method requires the InstaLODCmd path to be setup. Resets all settings to default values. Set respawnUI to true to automatically recreate the InstaLOD user interface, true by default. Optimizes the specified meshObject using the specified optimizeType. outErrorLog is a string reference that will contain error information. Optionally externalProfilePath can be specified to load a json profile from the disk. If no externalProfilePath is specified, a profile will be built from the settings structs. Optimizes the meshes specified in the objectArray using the specified optimizeType. outErrorLog is a string reference that will contain error information. Before an optimization can be started via script. The InstaLOD settings structs need to be setup to match the desired operation.